When Barry Fairbrother dies in his early forties, the town of Pagford is left in shock. Pagford is, seemingly, an English idyll, with a cobbled market square and an ancient abbey, but what lies behind the pretty façade is a town at war. Rich at war with poor, teenagers at war with their parents, wives at war with their husbands, teachers at war with their pupils ... Pagford is not what it first seems. And the empty seat left by Barry on the parish council soon becomes the catalyst for the biggest war the town has yet seen. Who will triumph in an election fraught with passion, duplicity and unexpected revelations? If there's anything that the Harry Potter novels have in common with J.K. Rowling's first adult novel , it's the quality of the writing. The language is fluid and brilliantly sets the tone, and creates a vivid setting of a town that feels like it's bigger than it probably is. The reader is introduced to so many characters in such a short span that even though I was a bit overwhelmed and nervous about being able to keep track of everyone, but it was surprisingly easy as the novel went on. The characters are distinct and Ms. Rowling does not shy away from any of the ugly details of their lives. Abusive husbands / fathers, prostitution, drug addicts. The plot is where The Casual Vacancy does not particularly work for me. It kicks off when Barry Fairbrother, a member of the Pagford Parish Council, passes away, leaving what is called a "casual vacancy." As inciting incidents go, it's compelling, but what follows does not adhere to the usual plot structure that readers expect. It all seems to be leading up to the election of Barry's successor on the Parish Council, which, when the successor is revealed, I was not compelled to feel a sense of catharsis. Similarly, when several children reveal the sins of community members (often their own parents) via the Parish Council Website using the pseudonym The Ghost of Barry Fairbrother, instead of leading to a huge climax in which the town confronted its problems and decided (or refused) to make amends, it just gets cleaned up neatly without any sense of consequence, which left me asking "so what?" Given how intricately Rowling plotted all seven of the Harry Potter novels, I was a bit disappointed here. I thought with a few hundred more pages she could probably have shown us a town undone by its own vices. Instead, we get more of a slice of life on a plate with no commentary. "Yet what stands out to me is the writing. The character material is brilliant. I don't think there's a clear protagonist in this novel and I loved the way that Rowling balanced her characters in such a way that it didn't feel like there was one. When I was reading A Game of Thrones I made the enormous mistake of assuming that the first people I was introduced to were the protagonists. 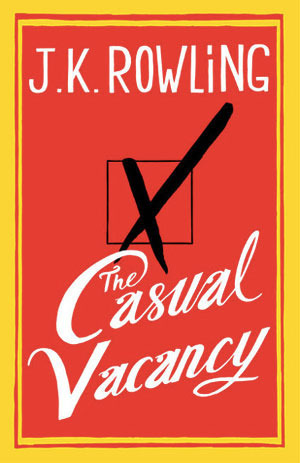 That's difficult to do in The Casual Vacancy, I think because of how quickly the reader is introduced to all of them. I got the sense that Krystal Weedon was at the center of the various plot lines, but she didn't feel like a protagonist to me. I loved the way that Rowling created a firm sense of negative space left by Barry Fairbrother's passing. There was a great sense of mutual respect among the citizens of Pagford for Barry but he wasn't perfect. Even without the "Ghost" business, I was able to feel the sense of loss his death provoked. I seem to recall that J.K. Rowling said that she had considered using a pseudonym when publishing this book and I'm glad that she didn't. The character of Simon Price, an abusive father to Andrew and Paul, and husband to Ruth made for an interesting comparison to Voldemort. What interested me was how much more terrifying I found Simon than I found Voldemort. Part of this, I think, is that we actively witness Simon bullying people to exert his power in a way we don't really see with Voldemort. It may also be a bit of desensitization. Perhaps I can easily distance myself from a fictional sociopathic mass murderer in a way that I can't from a fictional abusive father/husband. This is strengthened by the fact that we see Andrew, Paul, and Ruth afraid of Simon in a way we never really saw people being afraid of Voldemort. Had Ms. Rowling published this novel under a pseudonym, I would not have made that connection. All in all, I think there's a lot of interesting things in this novel, but the ending was a disappointment. If this book was written by anyone else, I wouldn't have read it. The premise outlined on the inside flap of the book jacket wasn't enticing to me. I gave this book a chance because of who wrote it, yet I didn't think of or expect anything like Harry Potter, nor did I make any connections between the characters of Pagford and those of the Potter books. I was turned off my the info dump shortly after the book begins. Rowling does an amazing job of world building and dropping in details that help flesh out the gaps or move the plot along that the info dump was an insult to her as well as to her readers. I had mentioned that the inciting incident of Barry's death was required in order to propel the story forward and give readers a reason to be interested and/or care about what happens to this group of self important, small town living, middle schoolers disguised as adults and their ignored, scorned, and abused children. Or maybe we are interested by the drama and intrigue because it kind of reads like a celebrity tabloid on display at the supermarket check out. Then again, who would want to read a book about a bunch of happy, harmonious, goody two shoes properly managing a small town? Not me. 1. I liked Krystal. She was my favorite character in the story. Truth be told, she was the one I most related to and the one I rooted for. I understand why Krystal's storyline resolved the way it did and that not everyone can get a happy ending, but of all people - it should have been her! 2. The ending wrapped up too neatly. It was gift wrapped and tied with an intricate and very pretty bow. This was one of my biggest complaints about the Harry Potter books (and YA novels in general) and I thought the book deserved a better, messier, and more intriguing ending than it got. I agree, except about HP being wrapped up too neatly, which I won't get into. I think we're attracted to this kind of story, like the tabloids, because we like the idea that beneath a nice little small-town exterior, these people's lives are as messy as our own. But you're right, most of the central conflict was side-stepped. The Casual Vacancy gets filled with no real drama whatsoever. And Fats takes responsibility for Barry's Ghost, which did nothing for me. I liked the children / teenagers in this novel way more than I liked the adults and it would have been great if they engineered the downfall of their parents in such a way as to force the community to confront its issues and come together to try and rise up from the rubble or walk away from it.